It was at my first culinary class at a local culinary college in Portland, Oregon that I tried my first taste of goat cheese. Back in 1993 goat cheese just wasn’t that common. I had tried it on toasted french bread in a French Bistro cooking course. It was excellent. Since then I have enjoyed goat cheese in several recipes, including this one that I make about every couple of months. 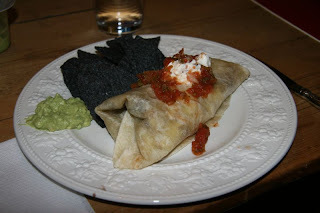 The photo above includes a dollop of sour cream and instead of green salsa I used Jack’s Special Medium Salsa. I also made some fresh guacamole to accompany the main course. Usually, I just make some Spanish rice but simply forgot tonight, so hey chips and guac is always a good quick backup! The other thing I tried this time was a tortilla product at Whole Foods by IndianLife foods. They are large tortillas with a good flavor but not enough of an improvement to justify the $4.79 price compared to the ~$2 packaged flour tortillas. My favorite choice is picking up fresh made tortillas at Mexicantown Bakery in Detroit’s Mexican Village. 1. Cut chicken into bit sized strips. In a bowl, coat evenly with cumin, salt, and pepper. 2. Seal tortillas in foil and warm in a 350° oven until hot, about 10 minutes. longer pink in center, about 6 minutes. 5. Meanwhile, combine the goat cheese with a little olive oil in a small bowl to make a paste. to enclose. Add more salsa to taste. I loove goat cheese. I literally was just eating beets and wishing I had goat cheese. Which vegetables would you recommend to make this vegetarian instead? What's you best one pan dish? Amy, to make this vegetarian I would add coarsely chopped carrots, parsnips and zucchini. You may want to try it with sweet potatoes and parsnips too. I think either combination would work well with the goat cheese and black beans. Let me know how it turns out if you try this. Del, my best one pan dish? Hmmm… Why you only have one pan? 🙂 I'm not sure if it is technically one pan but there is a chicken rice dish I make that I'll have post on here. I'll try to get to it this week or next.